Join Realwheels Theatre for an evening of savage wit and uncompromising truth-telling as they present CREEPS, the award-winning dark comedy by David E. Freeman that changed Canadian theatre forever. CREEPS will give audiences a rare glimpse into the lived experience of disability, filtered through a 1970’s lens. Featuring a truly mixed-ability cast, seven professional actors including three who lie with disability, the casting speaks to Realwheels Theatre’s ongoing commitment to fostering interchange between mainstream and disability arts sectors. David E. Freeman, who lived with cerebral palsy, was one of the first writers to put his own voice – a Canadian voice – on the stage in the early 70s. Written on a typewriter that Freeman operated with a stick held between his teeth, CREEPS tells the story of four disabled men who spend their days toiling away in a “sheltered workshop”. Tired of the way they’ve been treated, they rebel and barricade themselves in the washroom. The brutality and hilarity of Freeman’s uncompromising and sardonic dialogue drives the show and expresses the tension of the oppressed with a raw ferocity and clarity. “If you were to ask Canadian theatre artists, ‘which play, written and produced in the early ’70s, is recognized for having changed Canadian theatre forever?’, the answer would most likely be: David Freeman’s CREEPS,” Rena Cohen, Managing Artistic Director at Realwheels Theatre and the Producer/Dramaturge for CREEPS told me last week. She says that SKYDIVE offered audiences amazing technical innovation (in which a person with quadriplegia flies! 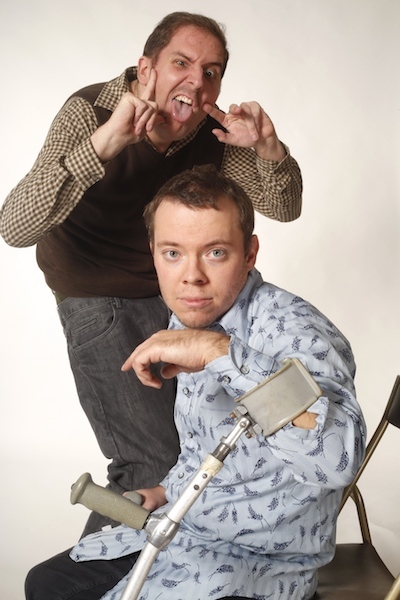 ), and the show had proven impact on audiences’ perceptions of disability. “I’d been working in arts management and as a speech/presentations coach when James invited me to discuss the company’s next steps.” Realwheels is a company on the rise, and in 2015 it received the City of Vancouver Award of Excellence. When CREEPS was first produced, Rena says Canadian theatre was itself a central metaphor of the play. Having known about the play for many years, Rena says it’s even studied in theatre programs – and a member of her cast today, Adam Grant Warren, actually wrote a paper on it at university. Since CREEPS is written and set in the 1970s, I had to ask Rena how well it translates to today. Rena says that our cultural norms have evolved, but Freeman’s characters are also so believably drawn that the universality of their experience – their humour, their frustration, their anger – all rooted in the genuine experience of the oppressed, makes the fundamental struggle of the play highly relatable. She says that if they’re successful, that will come across. In awe of the writing of this play, and how it can stand the test of time, I asked Rena if she had any advice for the next generation of playwrights. Tickets: On sale now at The Cultch’s Box Office, by phone at (604) 251-1363, or online. Add Value Shows: Get 2 tickets for just $20 for the performance on December 3rd and enjoy a special celebratory post-show reception in recognition of International Day of People with Disabilities. Learn more about Realwheels Theatre by following them on Facebook, Twitter, and YouTube. After CREEPS, Realwheels will be working on a community project called Comedy on Wheels, launching February 2017, with performances scheduled for May 2017. They’ll be working with international comedy expert David Granirer, harness the community’s ability to use humour to cope with life’s challenges.